In 2005, Junior League of Mobile (JLM) started Be Your Best Self Day. Once a year, we host the Distinguished Young Women (DYW) participants from all 50 states for a day of community service. This day was created so we could share our mission of promoting voluntarism, developing the potential of women and improving communities with the next generation of women. 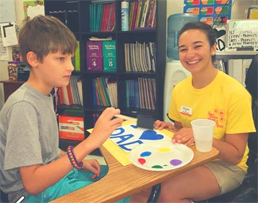 In 2016, Junior League of Mobile hosted the Distinguished Young Women participants as volunteers at The Learning Tree, United Cerebral Palsy (UCP) and The Joseph Project. The girls received hands-on experience working with a broad spectrum of children at both The Learning Tree and UCP. At The Joseph Project, they organized the food pantry and distributed food and clothing items. Junior League of Mobile is proud to be a part of this day each year, and of the difference these ladies are already making by being their best self. In 2012, JLM became a part of Distinguished Young Women’s Be Your Best Self essay contest. These scholarships are another way we live our mission by developing the potential of women.